The delicious, vegetarian GOOD TO-GO bibimbap features rice and veggies in a spicy gochujanga sauce made from Korean chilies for a well-rounded backcountry meal to warm you up on a cold evening. A delicious vegan backcountry meal to warm you up on a cold evening, the single-serving GOOD TO-GO Bibimbap features rice and veggies in a spicy gochujanga sauce made from Korean chilies. A backpacking feast that'll warm both body and soul, this lightweight, single serving of GOOD TO-GO Classic Marinara with Penne blends low-simmered marinara sauce and delicious brown-rice penne. Good-to-Go creates all natural, dehydrated gourmet meals that are light, easy to pack, and reconstitute to a delicious hot meal in just 20 minutes so you can enjoy a homemade meal anywhere you go. 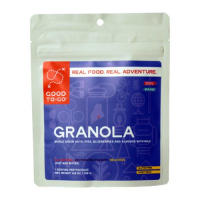 GOOD TO-GO pairs their delicious granola with whole milk to complete the meal. It's full of heart-healthy raw nuts and seeds, and flax for added protein and fiber. This risotto is cooked to perfection with onions in olive oil, rice, white wine, mushroom stock, basil pesto and sauteed mushrooms to create a creamy, yummy backcountry treat. A yummy backcountry treat, the single-serving GOOD TO-GO Herbed Mushroom Risotto is cooked to perfection with onions in olive oil, rice, white wine, mushroom stock, basil pesto and sauteed mushrooms. A mildly spiced, creamy curry dish made with yogurt and braised vegetables, the Indian Vegetable Korma from Good To-Go is the perfectly delicious end to your day on the trail.